From the treasured creator of Max and Ruby comes a soothing, quintessential lullaby of a book for the very young. 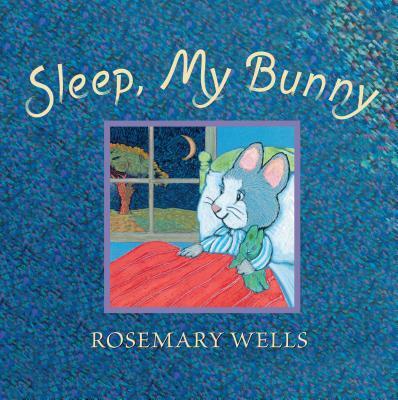 Rosemary Wells has written and/or illustrated more than 120 books for children and has received many awards. She is the author-illustrator of Stella’s Starliner and Love Waves; the creator of the beloved Max and Ruby stories and the Felix and Fiona series; and the illustrator of My Very First Mother Goose and Here Comes Mother Goose,both edited by Iona Opie. Rosemary Wells lives in a small town in Connecticut. Wells’s genius is in conveying preschoolers’ emotions and family moments with artful accuracy, and in these pages, the small bunny’s enthusiasms and the family’s tender, joyful bonds are irresistibly clear. Small spot drawings, linked to either words in the text or objects in the accompanying illustrations, provide an added opportunity for a seek-and-find game, while the dark, moonlit outdoors, viewed through each interior scene’s windows and rendered in Van Gogh–like swirls of dense, contrasting color, adds another exciting dimension to this reassuring gift to sleepy bunnies everywhere.